And Justice For Art: The Making Of "And Justice For Art" Book Cover Artwork. The Making Of "And Justice For Art" Book Cover Artwork. How to create a memorable book cover artwork for a book about Metal album covers? How to craft a graphic that could represent the subject matter for which it was created? 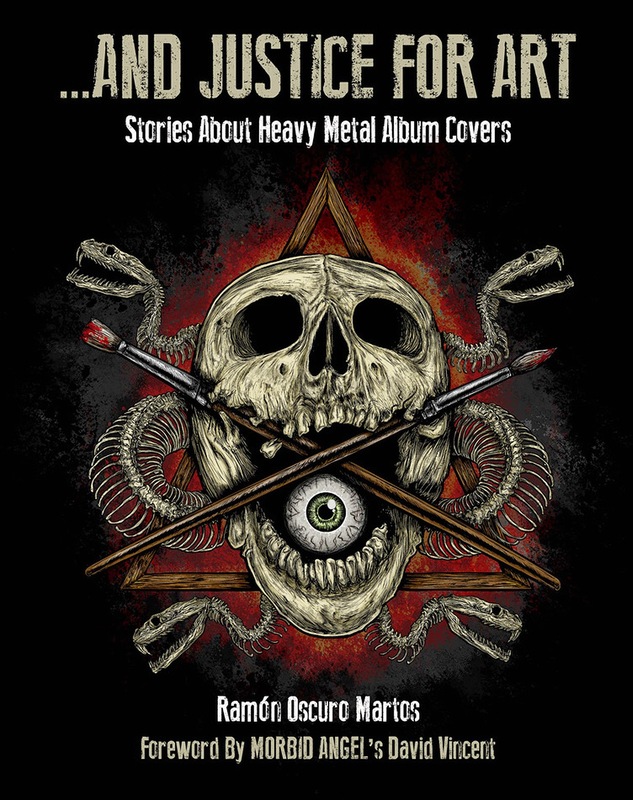 These were the challenges that American illustrator, Vertebrae33 and author Ramon Oscuro Martos faced when they joined forces to create the cover art for Martos' upcoming book, "And Justice For Art: Stories About Heavy Metal Album Covers." "By the time I brought this project to Vertebrae33's attention, we had been buddies for a while and I had even written a couple of articles for his art site, Metal Band Art," Martos (who also writes for Metal Underground and Pure Grain Audio) comments. 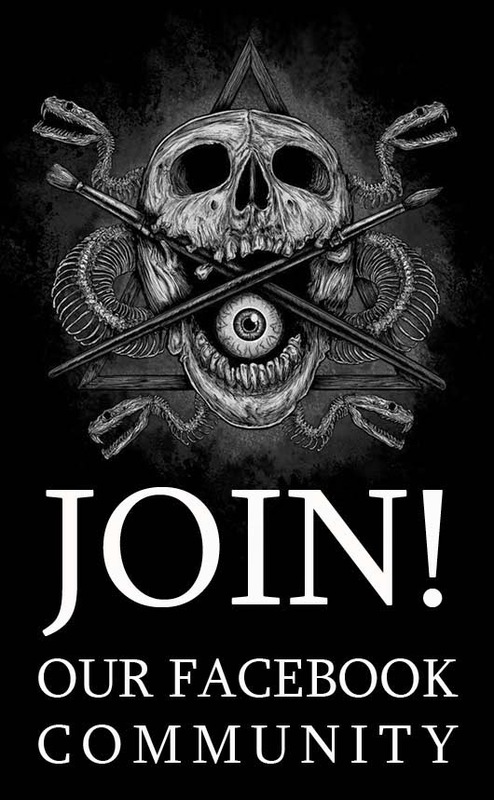 "I really loved the look of his previous illustrations for Slayer, Kylessa and Skeletonwitch. His well-defined lines and rich level of detail always impressed me, so I didn't hesitate in asking him to create the book's cover." 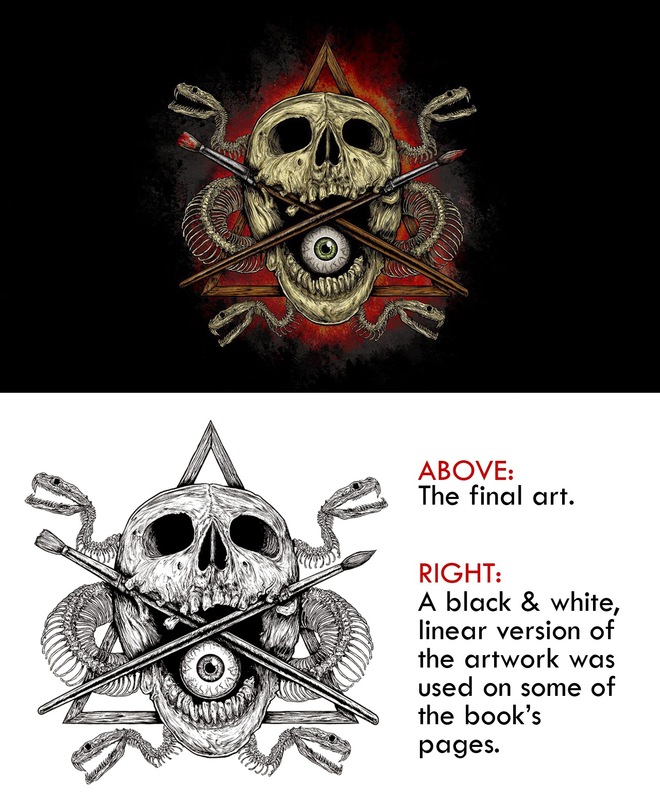 Martos knew he wanted an easy-to-remember kind of graphic, something that would allude to the book's main subject: the mix of visual arts and Heavy Metal music and the stories behind the making of album covers for albums like Slayer's "Reign In Blood," Metallica's "And Justice For Art," Carcass' "Heartwork", Motorhead's "Orgasmatron," Cattle Decapitation's "Humanure" and many others. After a lot of back and forth and sketching, a sort of shield/emblem was chosen for the book cover. 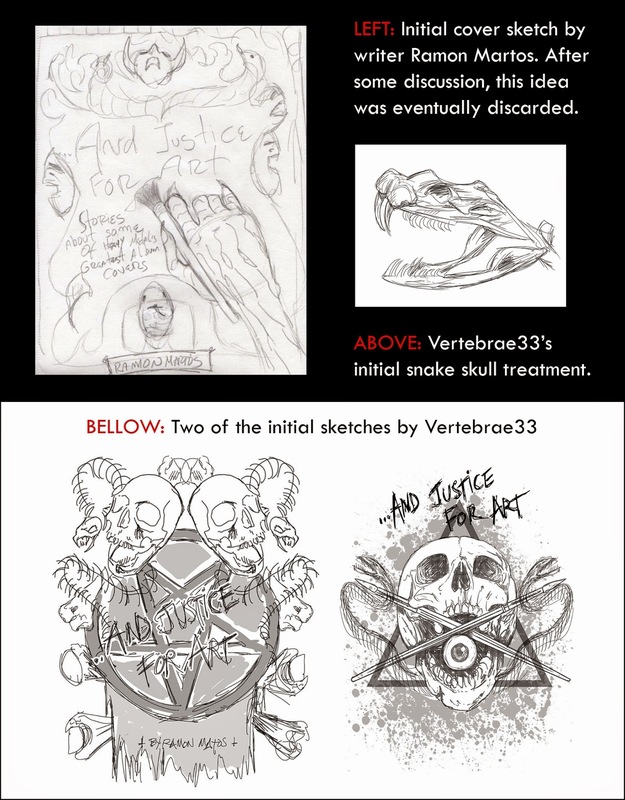 This graphic contains some of Vertebrae33's trademarks (like his distinctively-looking skulls) and elements that evoke the visual arts theme. "The most obvious are the brushes," Martos says. "However, you also have the eye, that besides being a cheeky feature, it's inviting the viewer/reader to discover the book's content, to look at all the images and analyze them. The wooden triangle in the background alludes to the divine power of arts, the power of elevating the human soul to a superior level of enlightenment—that's what art can do to the human spirit." The finished artwork pleased both Martos and Vertebrae33 while also cemented their professional relationship and friendship. "Ramón has an unbridled love of Metal art as well as a tremendous amount of passion and vision for his project," says the artist. "As an illustrator, there is nothing better than a vision realized and the satisfaction of the client. I am excited to see the And Justice For Art project finally come to fruition!" This book was printed thanks to the generosity of the contributors to the Indiegogo crowd-funding campaign that Martos launched last year. Because of its success, the author was able to print 300 extra copies that will be available as a limited edition. Those interested in owning a copy can contact the author at: andjusticeforart@gmail.com or pre-order here. For more updates, subscribe this blog or join And Justice For Art's Facebook. I own it...and it's epic!! !